I wanted to run some kind of cooking / baking activity with the Cub Scouts, however we meet at a community centre which does not have a kitchen. I therefore turned to some Microwave recipes. I tried a few different recipes and in the end decided on two cakes and one biscuit recipe. These are based on existing recipes, but I have made a few changes either to the quantities or ingredients to simplify or to reduce the number of ingredients I needed to provide. These are all easy to make and taste delicious. 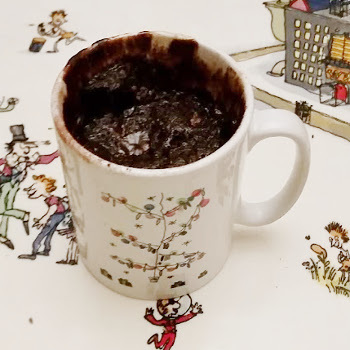 The cake recipes all require a large mug to reduce the risk of overflowing, although it’s not so important for the cookie. Note that depending upon you microwave it may take a different cooking time. Cooking these for too long may cause them to overflow, so check the microwave at least every 30 seconds. 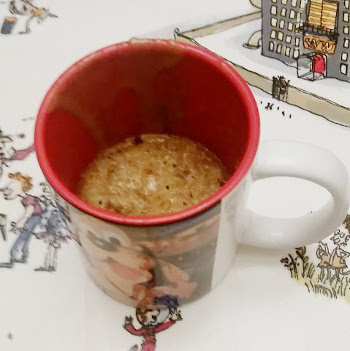 If the mixture starts to overflow the top of the mug then open the door for a few seconds and then continue microwaving until the required time. Always allow anything cooked in the microwave to rest before eating to avoid the risk of hot spots which could scald. For chocolate chips I use normal chocolate chopped into small chunks that are often less expensive than buying chocolate chips. Add the flour, baking powder and cocoa powder to the mug and mix with a fork. Add the egg and mix until the egg is absorbed. Add the milk, vegetable oil and vanilla essence and mix well. Add the chocolate chips and fold into the mixture. Cook for 4 minutes, checking at least every 30 seconds. A delicious cake with the contrast of white chocolate and Oreo cookies. Mix white chocolate chips and milk into large mug and microwave for 40 seconds. Mix with fork until the chocolate has melted. Add oil, flour and baking powder and mix with fork until flour is completely mixed in. 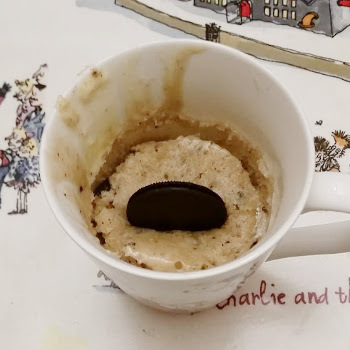 Break Oreo cookies into the mix and mash up with fork until only they are in small chunks. Leave to cool before putting an Oreo cooking in the top (optional) and serve whilst still warm. This recipe does not include baking powder so is more of a cookie than a cake. The chocolate chips can be substituted for dried fruit or other fillings for a different flavour cookie. Using a fork mix in sugar and vanilla essence. Mix in egg yolk and then add flour and mix well. Add chocolates chips and gently mix into the batter. Allow to cool for a few minutes before eating whilst still warm. This entry was posted on Wednesday, October 25th, 2017 and is filed under Cooking, Crafts, kids, kidscrafts, Scouts. You can follow any responses to this entry through the RSS 2.0 feed. Both comments and pings are currently closed. Please leave comments using the facebook comments below.